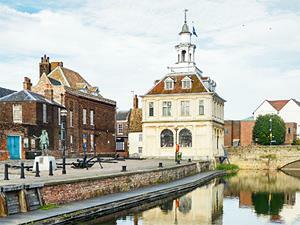 The elegant 1st floor long room provides superb views over the river Great Ouse, and contains displays on the merchants, customs men and smugglers of the past. Touch-screen computers provide further information about King's Lynn's famous mariners including Vancouver and Nelson. The ground floor (wheelchair accessible) has a similar display and houses the town's tourist information centre. From the A47: Arriving on the outskirts of the town, follow signs for town centre/old town.